The Senri & Osaka International School’s middle school baseball team defeated Sons of Light IS 3-0 yesterday afternoon in their second game of the day. Earlier they defeated Kansai University International Academy 14-4. They are now 3-0 this season and on top of the Western Japan Athletic Association. Euan L. went the distance, pitching a shutout and Owen had a clutch 2-RBI double in the fourth to break open the pitcher’s duel. Owen played first base in the second game, and pitched for 3 innings in the first game. The Sons of Light threatened to score twice in the game. In the fifth inning, the first two batters got on base, but then Euan struck out the next two batters and a groundout ended the inning. 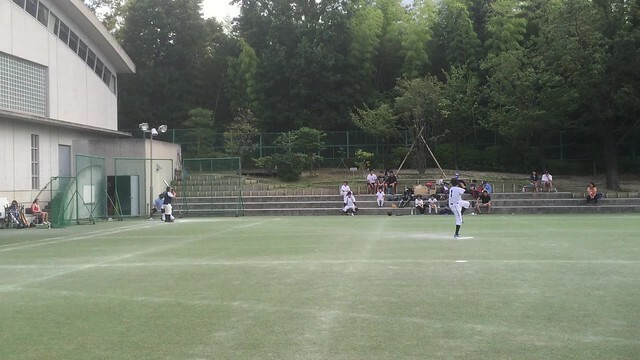 In the last inning, a runner was put out at third after a perfect throw by right fielder Rintaro. After a game there are distinctive Japanese practices of showing respect towards others. The video shows the final out and the post-game team bows towards the opponents, coaches and umpires. It is a nice tradition and manner of ending games, reinforcing sportsmanship. American sports should integrate something similar.